What can nature teach us about designing transport packaging for a decentralized delivery system? Part I of our case study introduced our PatternFox ProblemKit used to understand the context in which the problem exists (Step 1) and which aspects of the problem are particularly challenging (Step 2). In Part II, we covered how the PatternFox ProblemKit is used to abstract the problem into universal functions (Step 3) and define what the ideal solution looks like in terms of function, operating environment, and other limitations as supplied by the current system (Step 4). Now in Part III, we dig down into the biology. 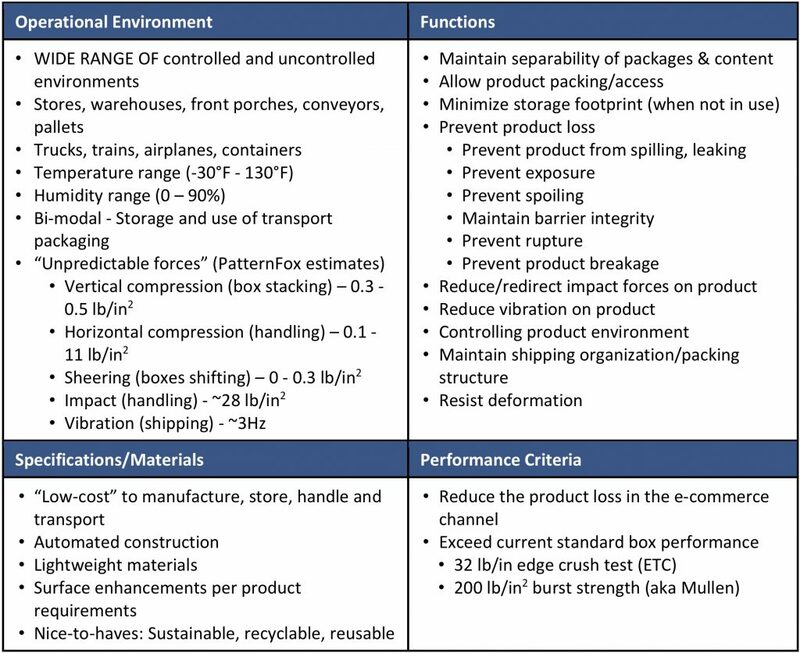 What biological systems can help us look at the transport packaging design problem in a new light …and can we apply the functional principles they use to our own engineered systems? PatternFox MatchKit Step 5: How do animals protect what’s important? First, we “go broad” and try to capture a wide breadth of biological functions using biological search terms related to the focus functions; “distribute force”, “redirect force”, “impact resistance”, “energy absorption”, etc. However, biologists often describe their systems using particular terms specific to the organism or its environment. If you’re not a biologist, the engineering-to-biology thesaurus developed by Nagel et al is a good place to start, and it’s often useful to just as a biologist! Our PatternFox team includes world class comparative biologists who always have ideas about potentially useful search terms, model organisms and systems. As we research deeper into the functions of each animal, we often find references to other animals with similar systems, and that offers additional evolutionary limbs to climb out onto. Note that not every limb in the functional tree leads to a relevant biological function, and project definition and timeline often dictate how many limbs we can climb and how far out we can go on them. Structure – What are the components of the solution, and how are they arranged? Function – What is the function that is performed by the structure? Behavior – How do the components operate together to effect the function? Structure: The snake egg shell has four distinctive layers. Total shell thickness is approximately 0.2 mm; layers 2 and 3 above make up ~70% of the shell thickness. Behavior: Multiple mechanisms of crack propagation resistance (e.g. microplastic deformation (1); multiple fiber orientations (2,3,4)) reduce the chance of ultimate failure to tearing regardless of the placement of the initial crack. The crack encounters i-KF, the i-KF are first delaminated and straightened before failure; the i-KF in layer 3 can form bridges over a crack that propagates in layer 2. The ultimate tensile strength of the egg shell grows with increasing initial tear length. This adaptive response is a characteristic advantage of the multiple solutions typically employed by biological systems. Patterns begin to emerge once we have a good number of relevant biological solutions defined; we find that there are many animals using similar strategies to perform the desired function. We group these animals together into functional design patterns. The following charts summarizes the relevant biological systems we found and their respective functional design patterns. Grouping the biological systems in this way gives us the opportunity to make inferences about biology’s preferred packaging strategies. In particular, solutions that are found in diverse and unrelated organisms may be particularly robust and useful. For example, while the woodpecker is identified specifically as having a “right-sized package” for protecting its brain during rapid pecking action, we did not encounter anything in nature being protected by a system that was not a perfect fit. Also, although we encountered several methods for force re-direction the most common was through rotating the fibril orientation among the layers of protective material. The list above has been prioritized by the number of organisms that use the biological strategy as it has been encountered during our brief search period. PatternFox MatchKit Step 6: How do we know the most promising solutions? We use the 4-box to remind us of the ideal solution while we score each organism between 1 and 5 following the rubric below. Note: it is possible to score a 0 if the organism’s function, environment, material, scale or performance is a particularly poor or irrelevant match. Here’s how our organisms compared. 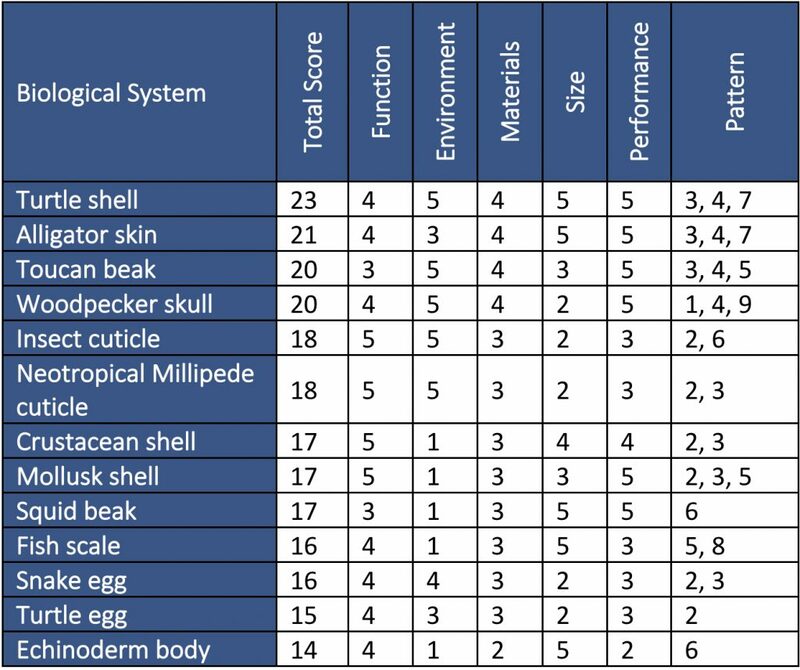 Based on our analysis, Turtle shell, Alligator skin, Woodpecker skull and Toucan beak are our top scoring biological systems for controlling acting forces, resisting deformation, evenly distributing forces and diffusing internal forces. Their high scores indicate a better functional match at a similar scale and a higher probability of their transferability to a packaging design. These top four scoring systems also have many functional design patterns in common. Pattern 3) improved stiffness/toughness via variable Young’s modulus and pattern 4) energy absorption via foam-like structures are the two most common in the top systems and are common solutions in many other biological systems as well. One more interesting thing I see in this list, beyond the biological system’s ultimate score, is that most of these systems use several functions to ensure protection. About one-third of the systems we looked into use three or more different mechanisms for protective function. Again, we find this to be a common pattern, and presenting our results in this way can help us establish the most effective set or combination of solutions. Though we present the PatternFox process as proceeding in one direction, the reality is that there are many feedbacks loops that take us back and forth between the MatchKit and the ProblemKit. We may review our design patterns in the MatchKit and realize a good way to reframe the problem to find additional relevant solutions. We may be dissatisfied by the relevance of the search outcomes and go back and refine search terms or dig back into more promising design patterns. We could keep searching for interesting biological systems ad infinitum looking for the “perfect” match….but our goal is not to necessarily find a “perfect” match. Because the domain of biology is vast, we need to avoid the trap of getting lost in analysis paralysis. While we are aware there are many more biological solutions we could add to this list, we forced ourselves to keep it small, around 50 biological source papers, in order to keep the project moving toward a design outcome. As much as we would love to go on finding more fascinating details about biology and how it all works together (and we really could! ), we do need to make something out of our analysis. Our final installation in this series, Part IV, will focus on the PatternFox DesignKit in which we take the most promising biological systems and see how they performs versus the current box from a purely theoretical point of view. In addition, we will describe how to take these biological inspirations and build a plan to make them into actual and real prototypes so that the potential of these systems don’t wither away on the bookshelf. Are you in the packaging industry or otherwise interested in e-commerce packaging? Connect with us using one of the links below! Nagel, J. K., Stone, R. B., & McAdams, D. A. (2010, January). An engineering-to-biology thesaurus for engineering design. In ASME 2010 international design engineering technical conferences and computers and information in engineering conference (pp. 117-128). American Society of Mechanical Engineers. Chang, Yin and Po-Yu Chen. “Hierarchical structure and mechanical properties of snake (Naja atra) and turtle (Ocadia sinensis) eggshells.” Acta Biomaterialia 31. (2016): 33–49. Print.